Those who trust in the Lord for help will find their strength renewed. They will rise on wings like eagles; they will run and not get weary; they will walk and not grow weak. Ever wondered what it would be like to fly? I don’t mean flying in a plane, or dangling beneath a kite or parachute. I mean sticking your arms out like a bird, or out front like superman if you like, and soaring above the earth; banking over the forests; skimming over the rivers; darting through mountain canyons; diving down and scaring the living daylights out of the members of your family; breathing deeply in the fresh air of free and effortless flight! And if you are someone who is scared of heights, imagine if you had no such fear. You could come and fly with the rest of us. From the early pages of history people have looked at the birds and wanted to fly. You may have seen on TV people flying in a wind tunnel but that’s not soaring high above the clouds. You have seen people jump out of perfectly good planes and ‘fly’ at least for a while, but gravity does it job and the skydiver has no choice but to pull the ripcord on his parachute. I’m sure every kid at some time has wanted to fly. Maybe it’s been a theme in your dreams but like all dreams there comes a rude awakening when you wake up and discover that you are still a prisoner of gravity. As much as we really wish we could fly, we have to walk to the bathroom, walk out to the kitchen for breakfast and walk to school or work. We aren’t built for flying. As adults we don’t think about flying as we did when we were kids. Not only aren’t we built for flying but we also carry a lot of baggage – we carry too much weight. Not only the kind of weight that shows up on the bathroom scales but the weight of worry, anxiety, paying bills, keeping the boss happy, and how our health crisis will turn out. All this weighs us down. If you own your own business and you wonder if you’ve thought about everything and planned for every contingency. You do care about those who work for you, and you realise that there may come a time when you will have to put off some of them. And this weighs you down. Then there’s your family. The people you love. You see your parents getting older; perhaps becoming infirm. You see your children struggling in this or that. Perhaps you’ve hit a rough patch in your marriage. When you were a kid love wasn’t so difficult and so demanding. But that’s because you were mostly on the receiving end of it. And now you are called to be the one who gives it; called to be the one who loves. This too can weigh you down. So what about those dreams of flying high above the world in complete freedom and in the open spaces where there is not a worry in the world? Nah! Not anymore! Life is way too heavy to entertain such thought. Flying – that’s okay for kids to dream about because they don’t have the worries we have but for us the world is too real. A bit like gravity – we can’t ever get away from it. And yet, what does the text from Isaiah say? "Those who trust in the Lord for help will find their strength renewed. They will rise on wings like eagles; they will run and not get weary." Hmmm. "They will rise on wings like eagles". With renewed strength they will soar above the earth with the powerful wings of an eagle. I don’t know about you, but Isaiah’s got my attention! Suddenly my childhood interest in being able to fly is renewed. Floating, drifting, circling, free as a bird. Is there a way to overcome the gravity of our lives, a way to lighten our loads, a way rise above it all? Is this just a dream, wishful thinking, belonging to the world of fantasy along with fairies, flying dragons and magic carpets? Just to put these words about flying like eagles into context. The prophet Isaiah was writing to the people of Israel during a time, when they felt like their strength was sapped and they had no hope. Like us, they were worried. The news wasn’t good. The dreadful Assyrians were breathing down their necks, and later it would be the Babylonians who would take them all away to live in exile. As they thought about all the stuff that was happening around them, they were weighed down and overwhelmed by the seriousness of their situation. They started to say things like, "God doesn’t really care about me! How can he? Look at all this bad and difficult stuff that is happening all around us. He’s not really in charge of things!" (Isaiah 40:27). You see what was happening here? They began to see their problems as being bigger than God himself. They forgot that the creator of everything, the everlasting Lord, whose love for his people means he will never grow tired of helping them, just might be able to help them with all their worries. You see over the years a subtle exchange had taken place. They exchanged their faith in God for a kind of do-it-yourself kind of attitude. We do the exact same thing! This DIY kind of Christianity excludes God from certain areas of our lives. I know God is there but I can handle this myself. "Let’s see, my work, hmm, no that’s not God’s problem. Finances, no. I can fix that. Relationship problems, no. That’s my responsibility. My love life, no God doesn’t know anything about that, that’s my area." Without even giving it too much thought we exclude God from different aspects of our lives. We can fix it we say and maybe it works okay for a time. But then we begin to feel the weight. Our blood pressure rises. We toss and turn. We get sick. We become depressed. The joy goes out of our lives. We despair. We slowly realise that the DIY approach isn’t all that successful after all. I’m sure that a lot us, including myself, have to admit to doing this at some time, if not more often than we care to admit. We sideline God and try to be our own god. We believe that we can do it alone, but that’s something God never intended us to be. God didn’t make us to stand alone against everything that threatens our safety and happiness. God made us to rely on him. This is where Isaiah comes in and we have this wonderful passage that was read earlier. He asks, "How can you be so dumb. Don’t you know who stretched out the heavens, made the earth and filled it with people? Don’t you know that it is God who created the stars? There are millions of them, and yet he knows when one of them is missing and if God knows each individual star, it follows that he knows each one of us personally and calls us by name. He knows when we are in trouble. No one can ever accuse God of turning a deaf ear to our needs. "Don't you know? Haven't you heard? The Lord is the everlasting God; he created all the world. He strengthens those who are weak and tired. Even those who are young grow weak; young people can fall exhausted. But those who trust in the Lord for help will find their strength renewed. Jesus affirmed what Isaiah said when he said things like, "Come to me, all of your who are carrying heavy burdens, and I will give you rest" or "Your heavenly Father knows all about the sparrows even though there are so many of them and he knows when a hair falls from your head. In the same way, he knows each of us intimately and personally" or "I am the good shepherd and I know each of my sheep and if one should get lost, I will go so far as to sacrifice my life to rescue that lost one". Jesus assures us that there is not a moment when we are not under his love and care. Yes, there will be times when we will intentionally and unintentionally lock him out of our lives. There will be times when we could have saved ourselves a heap of stress and pressure if only we had trusted in the Lord for help and realised that he is ready, willing and able to give us renewed strength and a fresh outlook on life and its problems. The apostle Paul realised that he knew what he ought to do and trust God more but found more often than not that he did what he knew he shouldn’t do. There were times when he was physically exhausted and drained, not knowing what will happen to him next. But in each case he came back to this one point, "God can raise me above all this. His love is so powerful that I can be confident, content, and certain no matter what the circumstances. The Lord will help me to face each thing that terrifies me and give me the strength to continue". In the end Paul says, "I can do everything through him who gives me strength" (Philippians 4:13). As Isaiah said, "Those who trust in the Lord for help will find their strength renewed. They will rise on wings like eagles; they will run and not get weary; they will walk and not grow weak". In other words, trusting in God to give us the strength that is beyond our own strength to deal with any situation, we can rise on wings like eagles. We can fly. We can soar high above our problems; we can fly free with the sky as the limit. 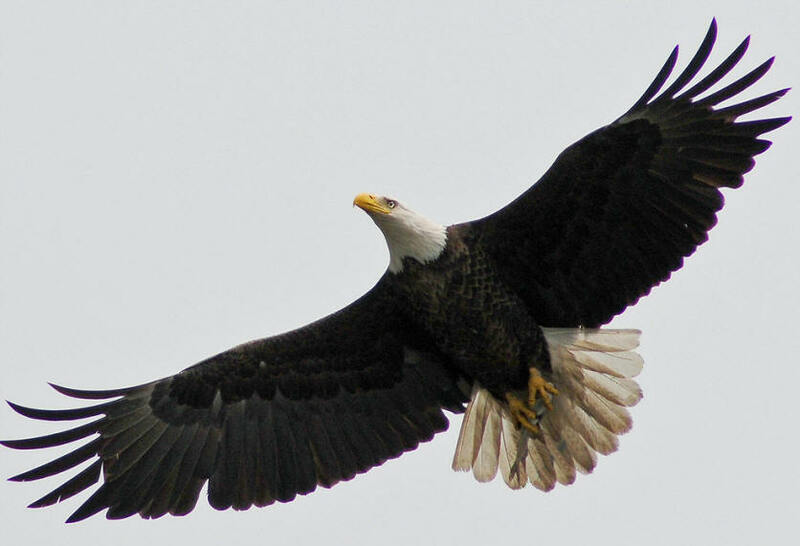 God wants us to fly like eagles. When we trust in God and his love for us and entrust our lives to the one who gave his life for us on the cross, everything else is dwarfed in comparison to the largeness and authority of the Lord. He is bigger than any problem we might face. And as we learn to trust him, we begin to see things from his perspective. He draws us upward in faith, so that we begin to get a bird’s eye view of things, or more correctly, a God’s eye view of things. Remember the dreams about flying, the fantasy stories like Peter Pan where children could fly; well they are not too far off the mark. We too can fly even though our feet never leave the ground. We can rise above everything threatens our security with a strength that comes from God. "Those who trust in the Lord for help will find their strength renewed. They will rise on wings like eagles".